The German Instrument of Surrender was the legal document that established the defeat and capitulation of Germany in World War II. 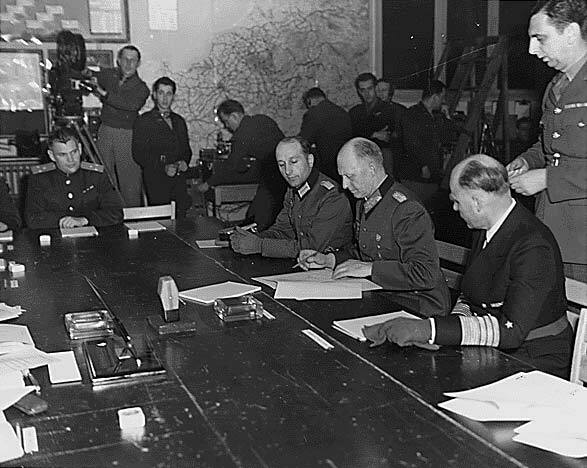 Members of the German Oberkommando der Wermacht (OKW) signed the agreement, as did representatives of the Allied Expeditionary Forces. The Soviet High Command also participated. French commanders served and signed as witnesses to the event. An additional declaration of surrender was also generated and signed by the same three entities. This signing was witnessed once again by the French, as well as additional members of the United States delegation. 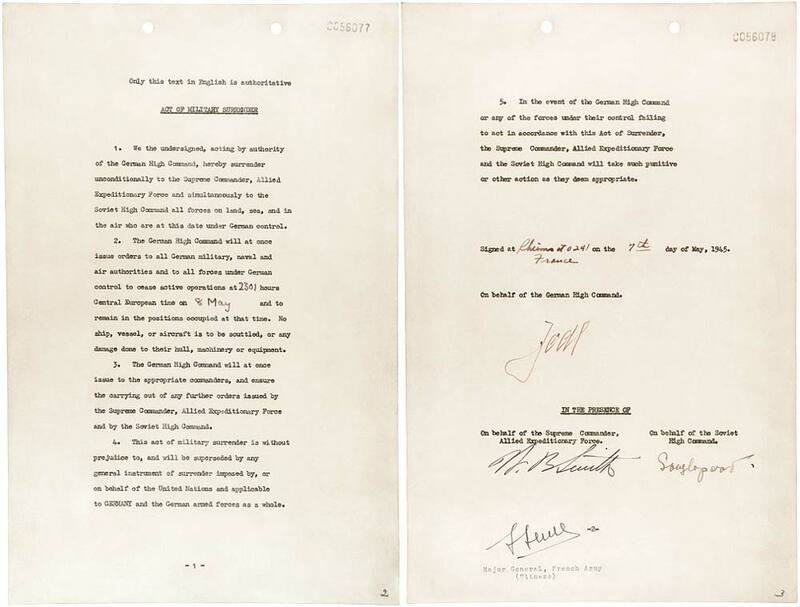 These papers were signed on May 7th and 8th, 1945 respectively. May 8th became known as Victory Day (or V-Day) in Western Circles, while May 9th is celebrated in the post-Soviet states. In Germany, of course, it is only acknowledged as “Tag der Kapitulation” or in English: the Day of Capitulation. The terms of the instrument were duplicated in three languages. The English and Russian versions are the only ones officially recognized. The European Advisory Commission, made up of dignitaries from Britain, the Soviet Union, and America, worked on the instrument of surrender throughout 1944 beginning on January 3rd. It was decided a single record of Germany’s surrender was necessary and that signatures by the German High Command must be secured. This insistence was due to the confusion that occurred following World War I. At that time, the papers of capitulation were signed by German government officials only. Subsequently the German military refused to acknowledge defeat due to the lack of proof that they participated in the surrender. In March of 1945, the EAC called together diplomats from Greece, Yugoslavia, Norway, Luxembourg, Belgium, Czechoslovakia and the Netherlands to gain their input on how this all important document should be worded. Each nation had their own ideas as to insure their own country’s best interests. The Greeks for instance, insisted that any remaining German military personnel on their island immediately surrender their weapons. Norwegian attendees wanted the document to include a specific clause acknowledging the Germans surrender in Norway. The Yugoslavian delegation refrained from recommendations pending the resolution of internal political issues. As mentioned above, there were actually two ceremonies involving Germanys surrender to the Allied Forces. The first took place in Reims, France. There was much confusion prior to this signing on the German side due to Adolf Hitler’s suicide and the subsequent removal of Hermann Goring as the next in command. Finally, it was ascertained that Grand Marshall Karl Donitz was the supreme commander responsible for the decision. This simplified the matters given Grand Marshall Donitz had already succumbed to the surrender earlier in 1945. So it was, the instrument of surrender was signed in a small red French schoolhouse at 14:41 (2:01 p.m.) Central European Time on May 7, 1945. It was to become official at 23:01 (11:01 p.m.) CET on May 8, 1945. Shortly after the initial signing, it was discovered the Soviet representative did not have proper authorization. Additionally, there were apparently minor differences between the content of a document of capitulation agreed upon by the “Big 3” powers earlier on. With this, it became necessary to hold a second signing ceremony in Berlin with a proper Soviet signee and verification of the terms of surrender. A second surrender act was therefore completed shortly before midnight on May 8th.